Well, this is not a Japanese food, but Chinese cuisine has influenced to Japanese cuisine so much. We eat Chinese on a daily basis just because we love it! boil for 5 minutes and reduce a little. 2.Strain into another sauce pan. Sprinkle powdered gelatin, and whisk to combine. Place over medium heat and mix to dissolve completely. 3.Pour into a container in an ice bath and chill in the fridge and until it set. 1. Put bread flour and cake flour and salt into a food processor. Pulse to combine. Pour Boiling water and vegetable oil and pulse to combine. from a food processor and put it into a plastic bag. Set aside for about 30 minutes until the dough comes to a room temperature. 3. Place a non-slip mat under the cutting board. Then take the dough out onto a cutting board and knead until smooth for 1 to 2 minutes. 4. Put it back to a plastic bag again while preparing the filling. 1. Cut the dough into four equal portions and shape into one-inch or 3 cm diameter cylinder. Work on one dough at a time and others have to be in a plastic bag to prevent from dring out. 2. Cut each dough into 6. Mark on the center, cut into 3 each half. Keep rolling when you cut the dough to make it easier to roll out evenly. Cut and roll 45 degrees, cut and roll 45degrees. 3. When you finish cutting dust with flours. Push by your hand to shape into a disc and put in a plastic bag. 4. Dust generously cutting board and rolling pin. Start rolling, push inward to the center, back, push inward, back and keep going. Be sure to make center is thicker than the edge otherwise, it will break when you finish wrapping. 5. The skin should be 2 and a half inches or 10 cm in diameter. tightly while rotating your dumpling. much how many pleats you made. Do your best to seal. steamer lined with cheesecloth. Napa cabbage or even parchment paper will work. 8.Steam for 8 minutes over high heat. 9.Let’s make the dipping sauce while steaming. Just add thinly sliced fresh ginger to black vinegar. That’s it! This is how to eat. 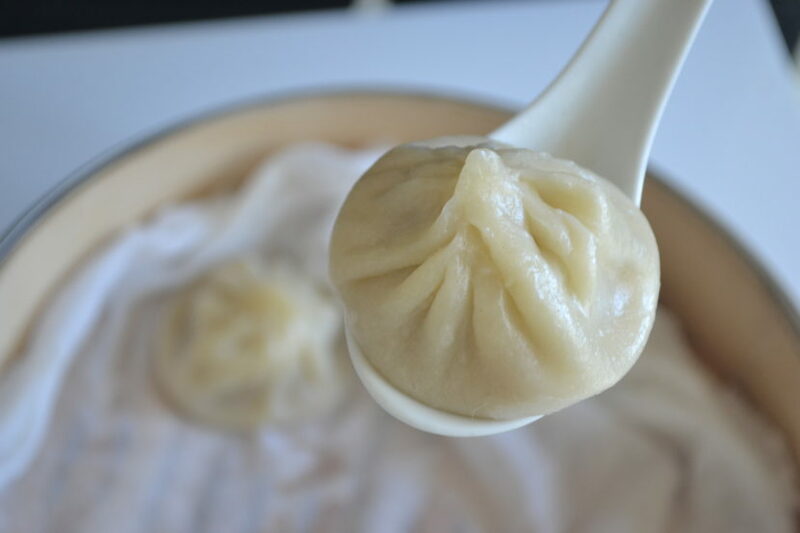 Carefully and slowly grab your dumpling with chopsticks and put it onto your spoon, Prick and release your soup and sip, then put some ginger onto the dumpling and eat in one bite!Soooo good! I used to work as a consultant to making a new recipe at a dim sum food service industry for five years. This is one of the most difficult dim sums to produce in a factory. So try to make it at home!